Mahindra Two Wheelers Limited (MTWL) was established in 2008 after the parent company Mahindra & Mahindra Limited acquired select assets of Kinetic Engineering. For the development of its scooter line-up, MTWL partnered with Taiwan based Sanyang Industry Company (SYM) and Italy-based ‘Engines Engineering’ which provides research and product design based support. The company has a production unit at Pithampur, Madhya Pradesh and a research & development center at Chinchwad, in Pune. Mahindra Two Wheelers launched one of its crucial models in the 110cc bike segment, Centuro in July 2013 followed by its game-changing model, Mojo in 2015. Mahindra Mojo was first showcased in 2011, it’s taken 4 years for the bike to finally be launched. From the concept to realization, the design of the Mojo has undergone a big difference. the front-fascia of the Mojo looks more practical with revised twin head-lamps. Mahindra Mojo comes with a class apart design, starting its unique story from its front headlight first. It gets two perfectly round lights enclosed in a compact frame with an extended visor in the middle. Mojo crown shaped arrangement looks perfect to its function and provides a good amount of wind protection. The front forks and swingarm have been painted gold in order to increase the overall appeal of the bike. It has twin exhaust design which is also a first in class option, providing not just better looks but much better exhaust note. It has rear arrow-shaped LED taillight gets an extended body part below its position, reflecting the light more beautifully in the dark. The grab rails have been perfectly placed for a superior pillion riding experience. The wind deflector around the radiator looks beautiful under the chiseled, muscular fuel tank holding the Mojo branding over it. The ground clearance has been kept 173.5 mm and the bike weighs 165 kg, when dry. The front of the Mojo gets a 320 mm disc brake (biggest in class) and the rear comes with a 240 mm unit. This makes it clear that safety has been kept best possible at the lowest price cost in the Mojo as well. The bike comes with the best in class Pirelli tires for excellent road grip on every surface. The front wheel measures 110/70 ZR17 whereas the rear is 150/60 ZR17. The windscreen of the Mahindra Mojo along with the entire headlamp casing has been redesigned to suit the personality of the rider. 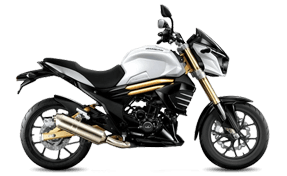 The bug-eyed twin headlamp of the bike is reminiscent of the Triumph Street Triple and above it sits the LED DRL’s. The alloy wheels, sculpted fuel tank, belly pan and the radiator shrouds endow the Mojo with a muscular appeal that is preferred by the riders. Mahindra has provided the Mojo with a best in class 295 cc, liquid cooled and fuel injected engine with Bosch ECU. The engine is good for 26.82 BHP @ 8,000 rpm and 30 NM @ 5,500 rpm. The gearbox is used on the same is a 6-speed unit. The Mahindra Mojo gets a totally new concept in its segment when it comes to its indication meters. The analog tachometer has been kept on the left side whereas the digital display has been placed to its right. The tachometer gets all new rev follower lights, lighting the tachometer reading being crossed by the needle. The display on the Mojo is Blue-lit and displays the odometer, speedometer, trip-meter and fuel indicator. The special features from the Mojo's console include a 0-100 kmph timer and top speed recorder. This sounds odd as Mojo has been focused as a tourer and it retains all the important figures like a race bike. The instrument console is overall nice and easy to read due to its better dimensions. High-speed stability of Mahindra Mojo is also impressive as the bike felt rock solid at triple digit speeds, an aspect that will be highly appreciated by touring oriented bikers. Powering the new Mahindra Mojo is a 295cc displacement single-cylinder motor churning out 28PS at 8,000rpm and peak torque rating of 30Nm at just 5,000rpm. The engine feels a bit strained and there is considerable wind blast and h4ence it is lived by commuters. The hassle-free process of purchasing Harley Davidson bike insurance online with minimal paperwork.